A Landing Page is a single web page that is designed to “land” people coming from a specific marketing/advertising campaign. It’s a bridge between your AD and the required action. Let’s dive in and check what is a landing page actually about. ‘A good landing page strategy attracts right customers to the exact right offers. <…> Always use the rule of one – one message, one offer, one call-to-action per page’ – these words from Wes McDowell, web-strategist from ‘The Deep End’ pretty much sum up what a landing page is about. A Landing page has one sole purpose – to convince your visitors to do the next single action (e.g. buy a product or leave an email address). Here is a great landing page example from ‘The Deep End’ free video-course. ‘I give free guides that I’ve spent $30,000 creating’, – says Neil Patel, one of the leading marketing experts. ‘And my stuff converts better than most people. If you are just scratching the surface, and not solving your visitors’ deep problems, they much less likely to buy from you’. You don’t have to go so much beyond as Neil does (though he is a real SEO-guru), but stick to this idea – an offer on your landing page has to resonate with people and bring unique value to them. Go outside of your office. Open your Landing Page. Show it to random people outside of your company for 5 seconds (check it with a timer!). Ask them to explain what is your product about. Was it successful? If not, you’ve failed 5-seconds test and your landing page need to undergo some serious changes. The 5-seconds test is an experiment that is based on the fact that people have a very short attention span. It means that you have not more than 5 seconds to transmit to your visitors 3 key points: what is your product about, how it will make their lives better and what do they need to get into it. To run the test you can use the experiment above or be more tech-savvy and make it via UsabilityHub. A homepage presents your company. You use it to build your brand, provide info about all of the services. A Landing page presents your offer. You use it to achieve one goal – generate leads or sales. A homepage has lots of different sections – mission, team, pricing, etc. It has to push your visitor to dive in and explore more. A Landing page has no navigation links and only one button – call-to-action. It has to convert prospects into leads or sales. 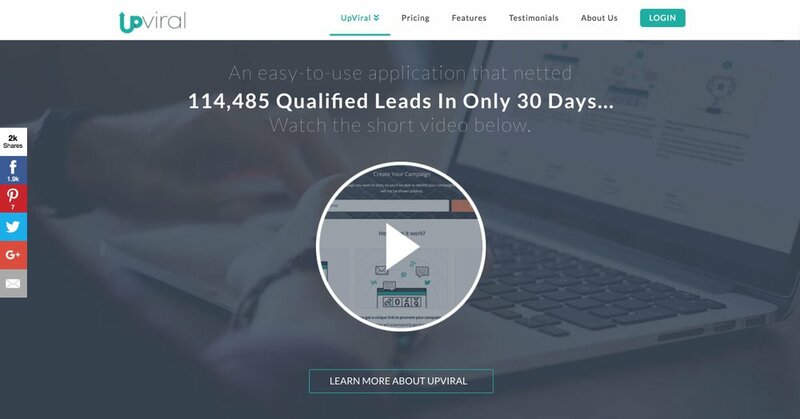 Check an example of a homepage and landing page from UpViral. On the homepage, they have a few different sections, general info about the company and product, navigation links. But the landing page for their Free Lead Generation Workshop is very simple. It has no navigation links or social share buttons, and only one call-to-action. Landing pages have a principal difference from usual websites. They have one purpose and one target audience, while traditional websites can serve multiple goals. This limitation is what makes landing pages such a powerful marketer’s instrument.